D.W.I gathers experiments as fictional strategies to generate infinity: the complexity of chaos, the space filling capacity of the rhombic dodecahedron, the replication of motorized mechanical systems as clones, or a machine’s effort to raise a pendulum against gravity to find perpetual equilibrium. In the late 70’s, chaos theory challenged traditional science’s mechanistic vision of the universe (La nouvelle alliance 1979). Reality became an open system based in change, disorder and entropy. Clones are represented as identical mechanical machines (inverted pendulums), that using human behaviors, fuzzy logic, drift to find endlessness equilibrium. Clones uses two identical inverted pendulums: based in a motorized mechanical system, the pendulums are mounted with the pivot point on a cart that moves horizontally. This movement makes the pendulum swing, and once the pendulum rotates to its inverted vertical point, an algorithm takes control of the movement of the cart and tries to find equilibrium against gravity. 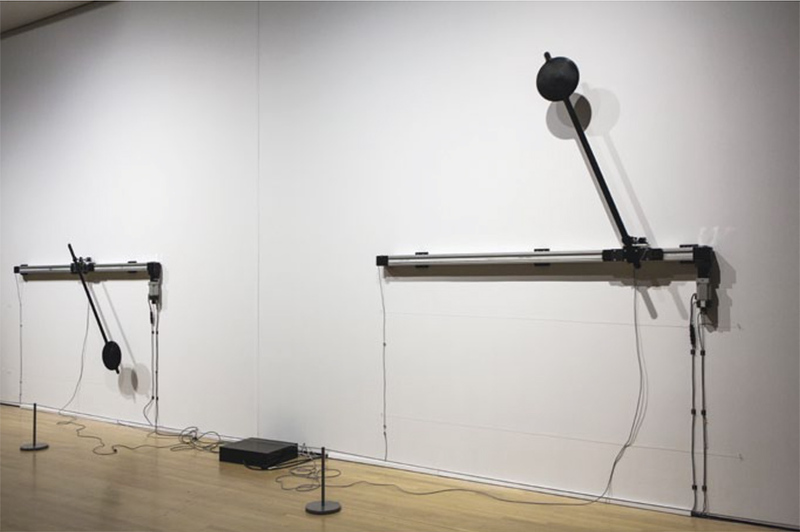 The artist explores the expressiveness of the system, using human size heavy pendulums, capable of generating enough inertia to generate self-rotation. He also tries to humanize the system in a game of failures and successes.